America's Test Kitchen By using a plate and paper bag, you can make Real Buttered Popcorn without the artificial ingredients at home. Why stick with just butter and salt when it comes to popcorn flavorings? Here are some inventive ways to make popcorn special – perfect for a sleepover or a movie night with friends. • Parmesan-Herb Popcorn: In small bowl, stir together 1/4 cup grated Parmesan cheese and 1 tablespoon Italian seasoning blend. Sprinkle over popcorn along with salt just before serving. • Sriracha-Lime Popcorn: Stir 1/2 teaspoon sriracha sauce into melted butter. Sprinkle 1/2 teaspoon grated lime zest over popcorn along with salt just before serving. • Cinnamon-Malt Popcorn: In small bowl, stir together 1 tablespoon malted milk powder, 1 tablespoon packed brown sugar, and 1/2 teaspoon ground cinnamon. Sprinkle over popcorn along with salt just before serving. Microwave popcorn is a great idea – in theory. But most packaged options have a long list of unnatural ingredients and don't taste very good. 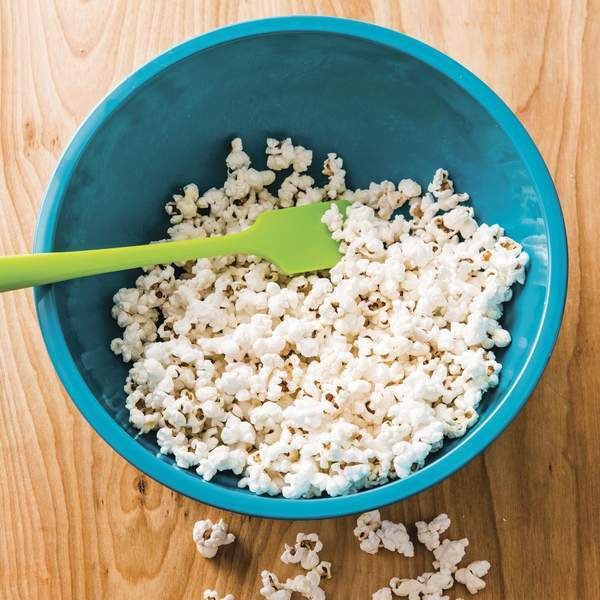 This fun recipe turns a plain old brown paper bag – the kind you might use to hold your lunch – into a microwave-safe package for popping corn kernels. Make sure to use a plain bag without any writing (colored inks are often not microwave-safe). Microwaves vary in strength so rather than watching the clock, listen for the popping sounds: When they slow down, the popcorn is ready. Be careful when opening the bag with the popped kernels – there will be a lot of steam in the bag, so open it away from your face or hands. Follow this recipe with your kids. Place popcorn kernels in clean brown paper lunch bag. Drizzle kernels with oil. Fold over top of bag three times to seal (do not tape or staple). Shake bag to coat kernels with oil, place bag on its side on large microwave-safe plate, and shake kernels into even layer in bag. Place plate in microwave and cook until popping slows down to one or two pops at a time, 3 to 5 minutes. Use oven mitts to remove plate from microwave (plate will be very hot, ask an adult to help). Set aside to cool slightly. Place butter in large microwave-safe bowl (big enough to hold popcorn), cover, and heat in microwave at 50 percent power until melted, 30 to 60 seconds. Use oven mitts to remove bowl from microwave. Carefully open paper bag (be careful of hot steam) and pour popcorn into bowl with melted butter. Use rubber spatula to toss popcorn with butter. Sprinkle with salt. Serve.